Between 2006 and 2009, an international team of historians, archaeologists, and geographers traveled to France to rediscover and document where Fentress County-native Sergeant Alvin C. York made his heroic stand. 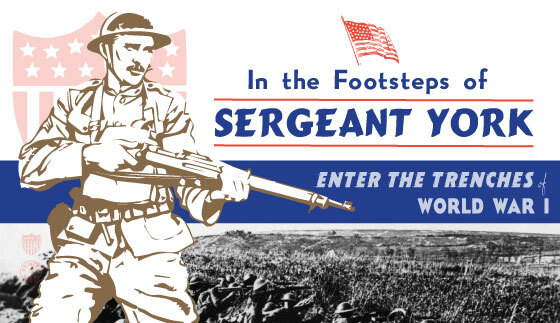 In the Footsteps of Sergeant York, a traveling exhibition from the Museum of the American Military Experience, showcases this groundbreaking research and allows visitors to retrace the steps of one of America’s best-known military heroes. Sergeant York - English Version - 1941 - Gary Cooper - SDC Films from brtiAmerica on Vimeo.